Further to correspondence re ex MTB 253, later Motor Yacht Medyna, if anyone has further info on her, I would appreciate hearing. If this is read by anyone not a member of BMPT, and unable to post messages on here, my email address is vampire@uk2.net, and any interesting results can be posted on here by me. Any info will be most welcome. 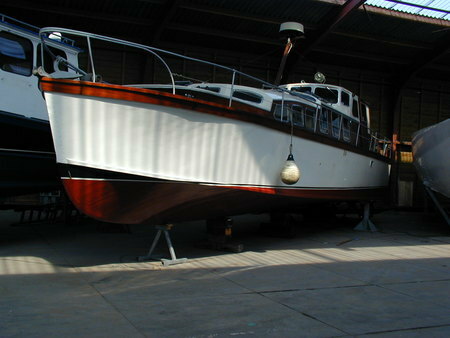 Peter Leggett, former owner (1976-1991) ex MTB 253, later Motor Yacht Medyna. Hi, ASR1255. Thanks for that, though of course it depresses me to know it. I last saw MTB253 in 1994, belonging to a man called Alex Plant, who had bought her cheaply from the two idiots I sold her to, who had near-ruined her by letting fresh water through the decks which had been fine when I sold her. They tried to fit laid decks......on an MTB !! Alex Plant had asked me to come down while she was in dry dock at Canvey, and show him any suspect areas. There was only one, which I showed him, and he replanked the outer d/d there. I then heard that she had been taken to the Medway, under tow ! This surprised me, as I sold her with two really good S6M Perkins, both on the button, and I started both for Alex Plant three years after selling her myself. I was told by someone at Canvey that the tow-job was because the rudders had seized, and not at straight ahead, so she was towed somewhat diagonally. I then heard that she was for sale on the Medway, somewhere around 2007, for a reputed £85,000. But as the slump came immediately thereafter, I assumed this didn't result in a sale. Maybe I was wrong. A friend then rang the agent, who said he could not help, as the boat was sold. Since then I knew nothing, until I found the correspondence on this website, and the rest you know. PLEASE do let me know all about her, depressing or not. I would dearly love to go and see her, even derelict. She was an enormous part of my life. I bought her at Wivenhoe, Essex, and cruised her and lived on her for nearly 16 years, on moorings at Teddington, Twickenham, Benfleet and Canvey. I worked and worked on her all that time, re-engined her, part re-framed her, spent fortunes on her, and sold her only because she became a death-ship, as explained above. (But the friend who died aboard her of cancer had loved her as much as I had). I had known the boat ever since my early childhood, watched her as a child, and bought her many years later. It seems she needed all that work I did, as after it stopped, she has not lasted. Thanks so much for replying, and all info will be really gratefully received. Glad you have saved some bits for 219. Hi, is there anyone who knows something about this boat?